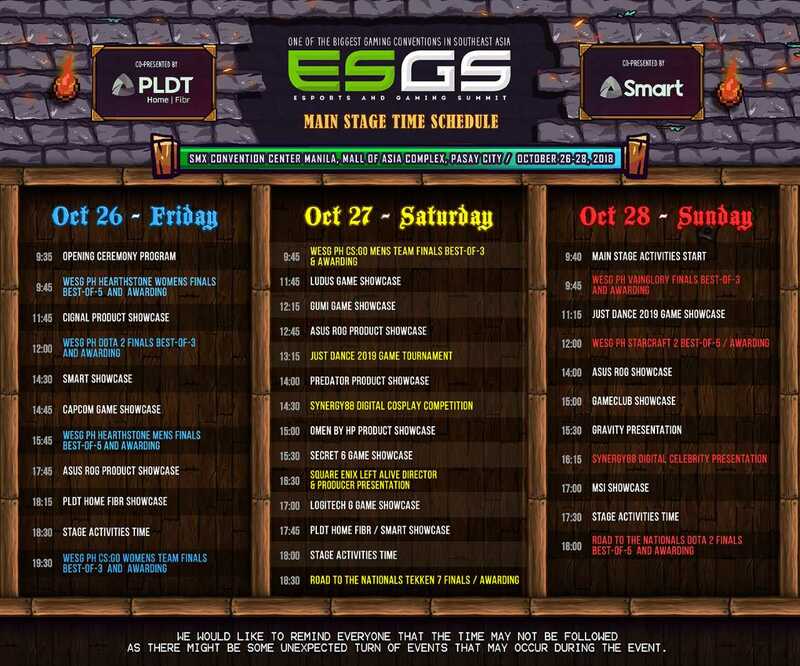 Get Hyped for ESGS 2018, October 26-28, 2018! Esports and Gaming Summit 2018 (ESGS) has started its 3-day event today, and we are inviting you to visit and enjoy booths from different exhibitors! Another year, another huge gaming summit here in the Philippines! Gariath Concepts is back at it again on giving all of us one hell of a weekend showcasing various exhibitors with their latest line of titles and products. It is now happening today, October 26, 2018 on SMX Convention Center, SM Mall of Asia Compound, Pasay City, and the event will be held until October 28, 2018. You can buy the admission ticket for P210.00 only. On the gaming side of this event, Kojima Productions has a booth in the event as well selling their exclusive merchandise. Capcom is showcasing their upcoming titles, such as Devil May Cry 5, and Resident Evil 2, which you can try personally. From the local side of things, Project Xandata by Secret Six is back with more activities, even Synergy 88 is promoting their newest animated series, Barangay 143. Of course, more game publishers are showing off their titles, such as Gameclub, Gumi, Gravity, Monstronauts, Most Played Games, Ranida Games, NetEase Games, GMA New Media, Valofe and more. There are many more activities you can visit in ESGS 2018, you may visit the Artist Valley, where you can buy fan arts or even commission the artist for the art you want. There are also more merchandise than last year, so if you would like to get yourself an action figure, apparels, you can easily look for on in this event. Local indie game developers are even showcasing their games with the support of The Game Developers Association of the Philippines (GDAP), visitors can play up to more than 40 upcoming games! 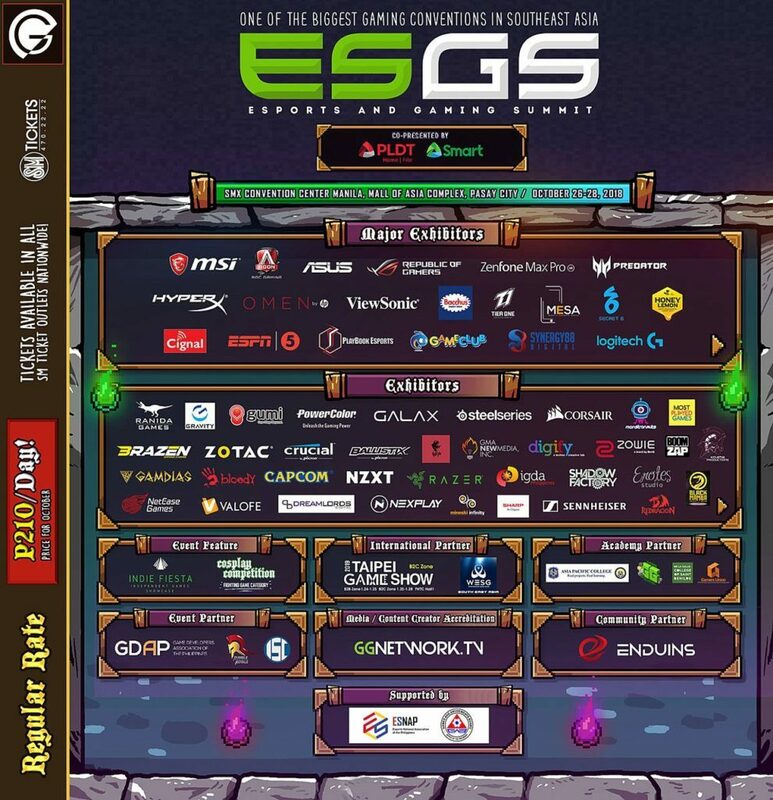 One of the major events in ESGS is the Esports tournaments. Months prior to this event, Dota 2 and Tekken 7 players from across the Philippines fought to reach the finals which will be held in this event. A total prize pool of P1.2M for Dota 2 and P300,000.00 for Tekken 7 are at stake here, so viewers will definitely witness some high-level competency from all entrants. We are fully committed to supporting our esports athletes by providing them with opportunities from the grassroots level, all the way up to creating the first franchise-based professional league in the Philippines. PLDT and Smart are not only building esports teams for The Nationals – we are also ensuring that gamers are equipped with the best gaming experience through our PLDT Home FIBR and Smart LTE networks. The past three months have truly shown the potential of esports in the Philippines and the immense amount of talent our country possesses. We look forward to seeing the finalists compete at the Road to The Nationals grand finals and bring esports in the Philippines to the next level. These are not the only tournaments as there are also tournaments for Starcraf 2, Hearthstone, VainGloryu, and Counter-Strike: Global Offensive, which the entrants will fight for the spot as the country’s representative for SEA finals, which is going to happen by the end of 2018. Even for the Mobile Esports Arena (MESA), they will be hosting mobile game tournaments across the three-day events, the games included are Hearthstone, Mobile Legends, and VainGlory. Lastly, Playbook is also hosting their game tournaments, which primarily focuses on fighting games at the Fighting game Arena. These games are Tekken 7, Street Fighter V: Arcade Edition, Super Smash Bros. for Wii U, Blazblue Cross Tag Battle, and Dragon Ball FighterZ. The winner will represent the country at EVO Japan 2019 on February 2019 on Fukuoka, Japan. Last, but not the least, there is an annual cosplay competition, where the theme is all about the best fighting game cosplay! The judges will be Kang Dupet, Loki Heart, and Tessa who will evaluate the contestants. The competition is powered by Animax Philippines and organized by Anime Alliance, and there is a grand prize of P20,000, P12,000 for the 1st runner-up, and P7,500 for the 2nd runner-up. For the complete schedule of tournaments, you can go check the image below. 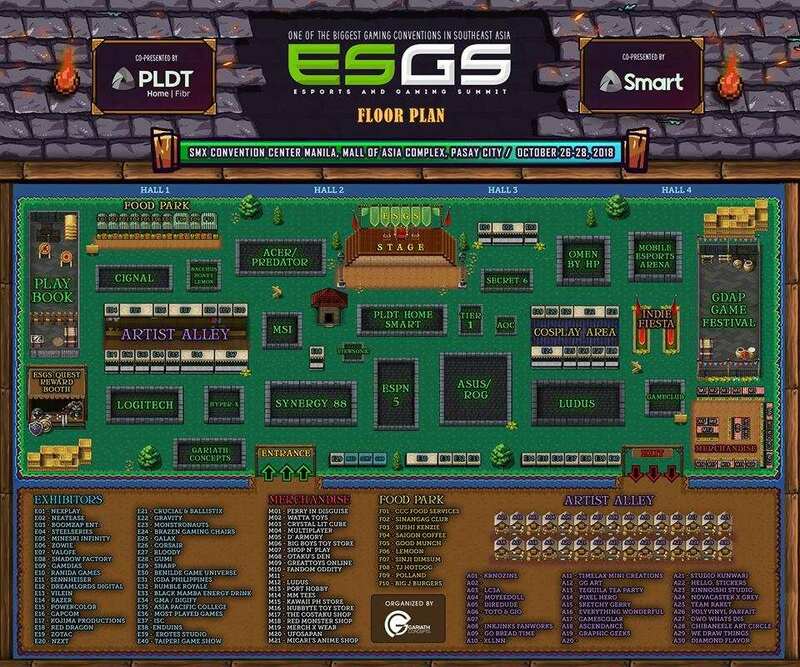 Organized by Gariath Concepts and dubbed as “one of the biggest E-Sports Competition and Gaming Conventions in Southeast Asia.” Now at its fourth year, ESGS continues to grow and provides the best gaming experience in the Philippines. The Esports and Gaming Summit 2018 is co-presented by PLDT Home Fibr and Smart. ESGS has done it again this year!